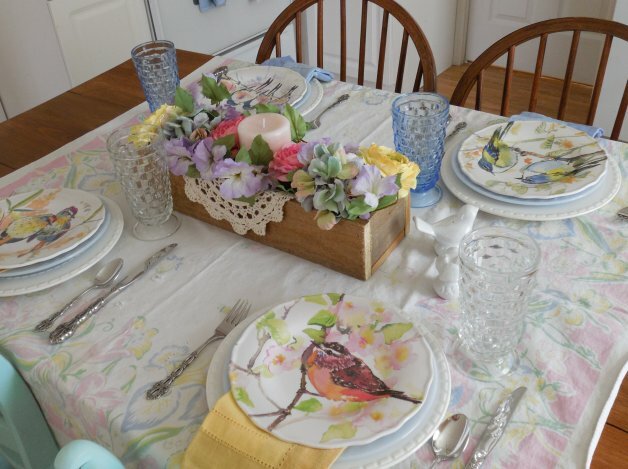 Of course, I’m sharing this post for the 500th Tablescape Thursday at Between Naps on the Porch! Congratulations, Susan, and thank you for all the inspiration these past 10 years! 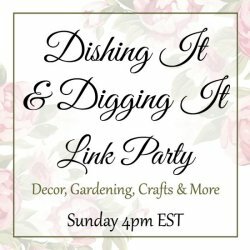 If you have enjoyed any of the tablescapes I’ve shared on my blog, you know that I usually link them to the tablescaping blog link party at Between Naps on the Porch. 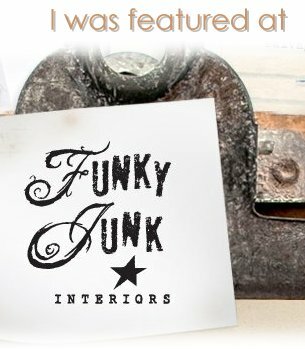 I think I first discovered Susan’s blog in about 2010, and she had already been hosting the weekly link-up for at least a couple years. 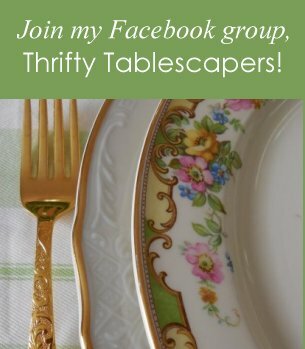 This week marks the 500th Tablescape Thursday! 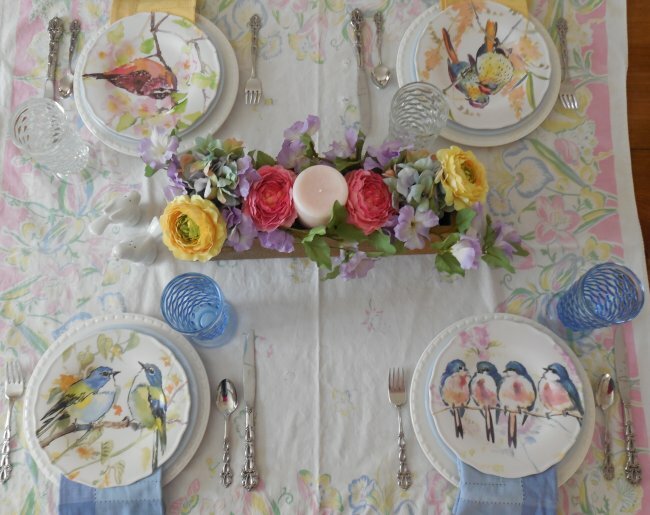 Can you imagine… Susan has been setting beautiful tables, and giving others a place to link up their own beautiful tables, creating so much beautiful inspiration – for 500 weeks. That’s almost 10 years! 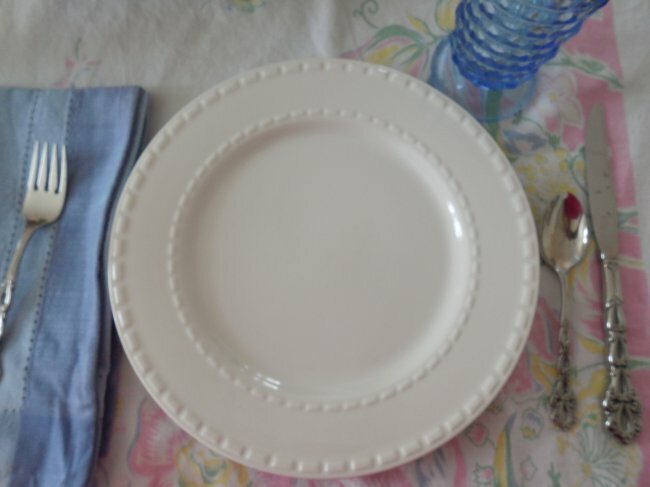 Susan doesn’t normally set a theme for the week’s link-ups, but for Week 500 she suggested that bloggers share a few pictures from some of their own favorite tables. I thought I would do just that, but I’ve only been “setting pretty tables” with any regularity for about a year. 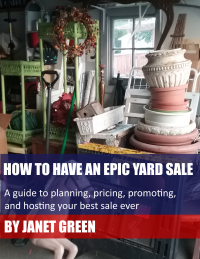 So because I’ve got a limited number of tables from which to choose favorites, I’m also going to include in this post the most recent table that I set this past weekend. First though, here are five tables I’ve set that I really love! 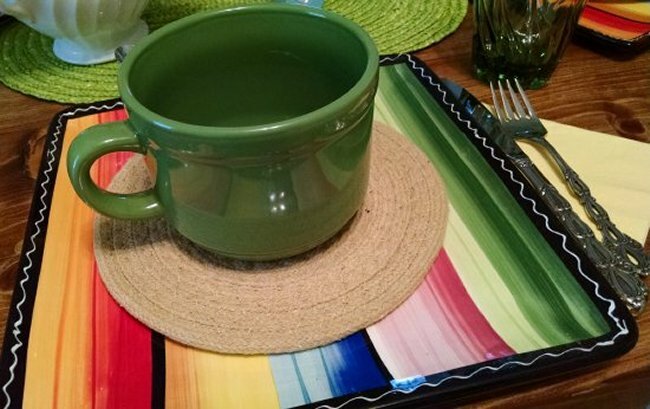 Cinco de Mayo table featuring “Serape” by Certified International. This was the first table I set using my new handmade harvest table top. 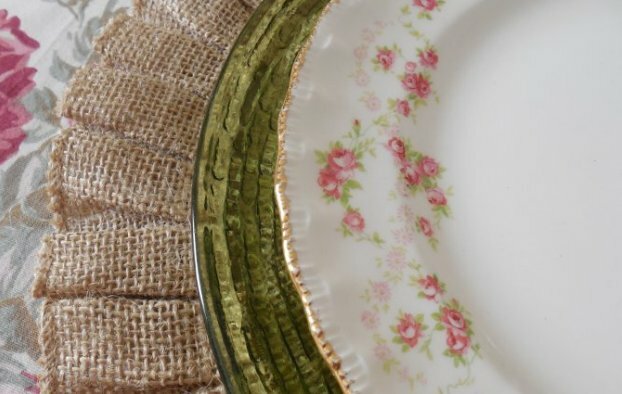 These dishes are so different from anything else I collect but I thought they were really cool – and so easy to pull colors from on the rest of the table! 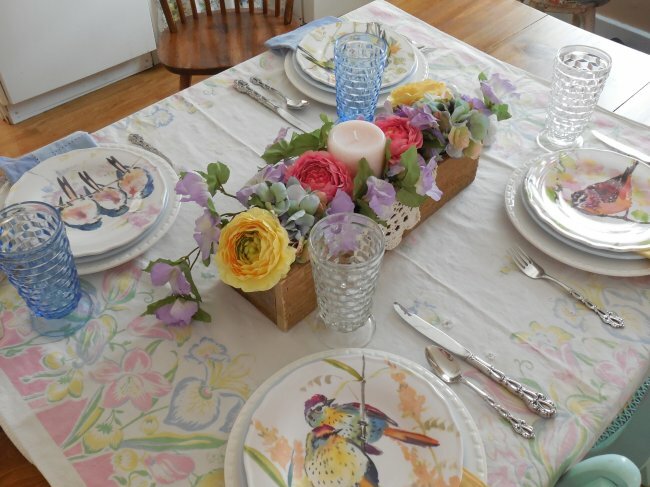 Late Summer Table featuring “Florence” by the Pope Gosser Company. 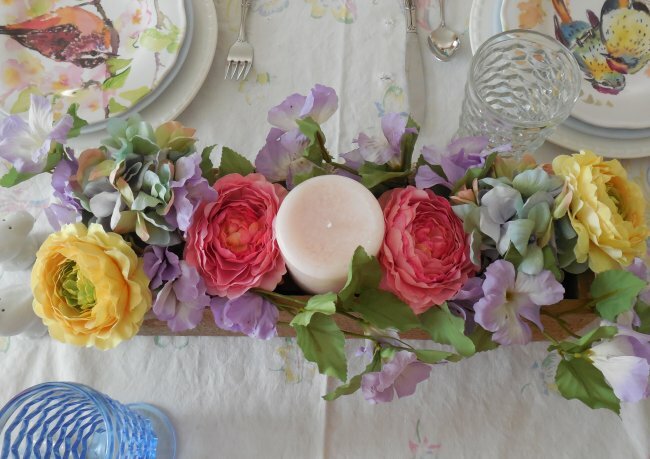 I wasn’t quite ready for fall when I set this table, so I proclaimed a fifth season called Faded Summer. I just love all the colors and textures in this one! 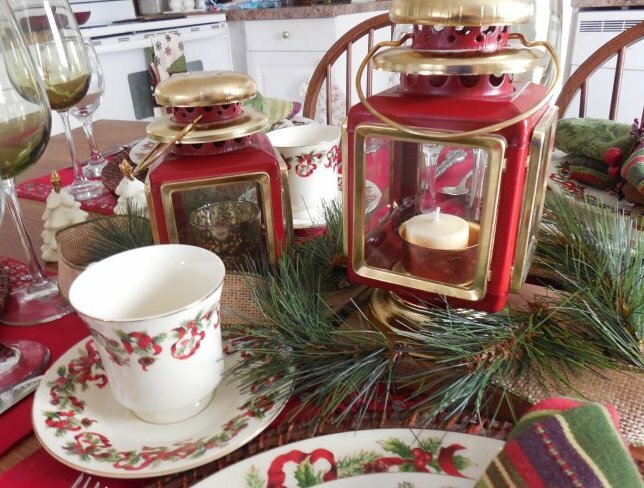 Woodland-themed Christmas table featuring “Christmas Ribbon” by World Bazaar. 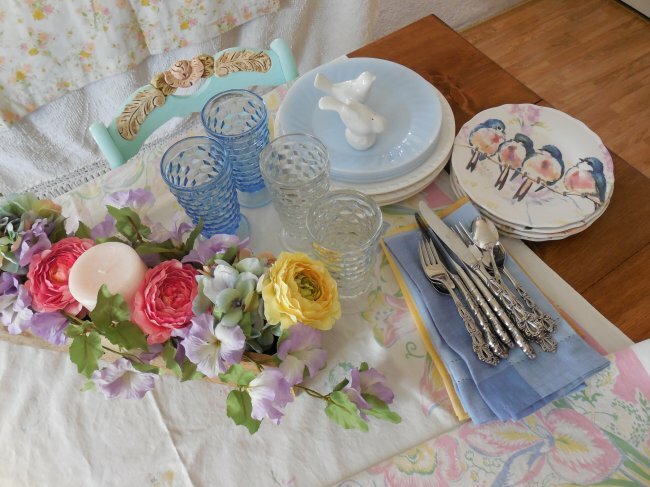 At the time I set this table, I was debating whether to keep or sell these pretty dishes. 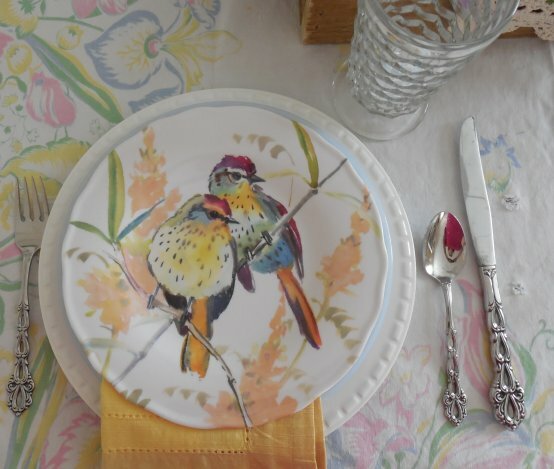 I had them listed online the day I was setting the table, and they sold the next day. 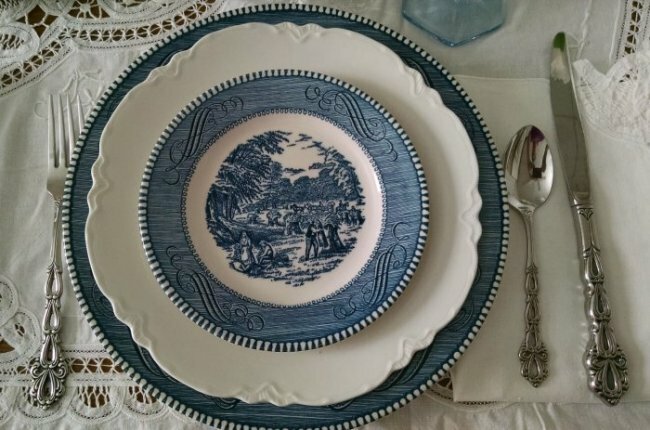 Blue and White Currier & Ives – the set of dishes given to me by my grandmother, which set me on a path to collecting vintage dinnerware. Blue and white always seems to be a theme in January, with the fresh start of a new year. My favorite of all my tables so far has been this one, set for Christmas in shimmery gold-shouldered plates with handpainted glassware. This table is a favorite because it was a vision in my head that became a beautiful reality. I couldn’t believe how shimmery all that gold was. Now for a brand new table… if you follow me on Instagram you might know that I have spent the last ten-or-so weeks with a broken ankle, so I haven’t been able to get around too well lately. This past Saturday though, I was two days away from getting my final clearance to start walking and driving again, so I decided it was probably safe to putter around the house and haul out some dishes. 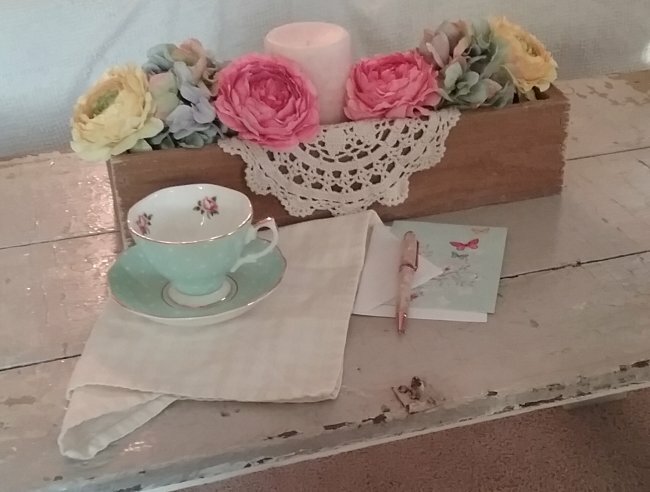 My inspiration for the table was this little centerpiece that I had styled for my sawhorse coffee table in the living room. I had been looking at it all week (and loving it!) 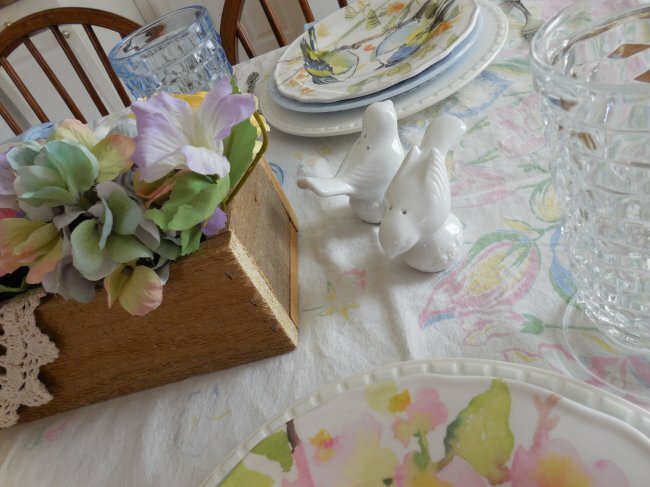 and decided to move it onto the dining table. 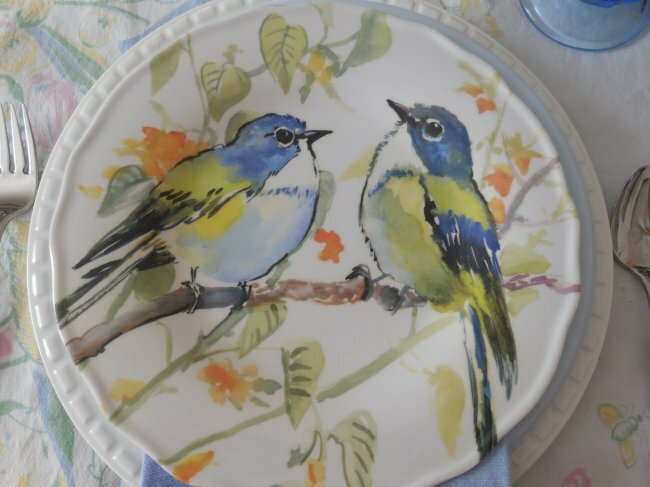 It occurred to me as soon as I got started that this piece would be perfect if set with my new Pier 1 “Spring Birds” plates – a set of four, each with a different bird scene. I just love each and every little birdie. 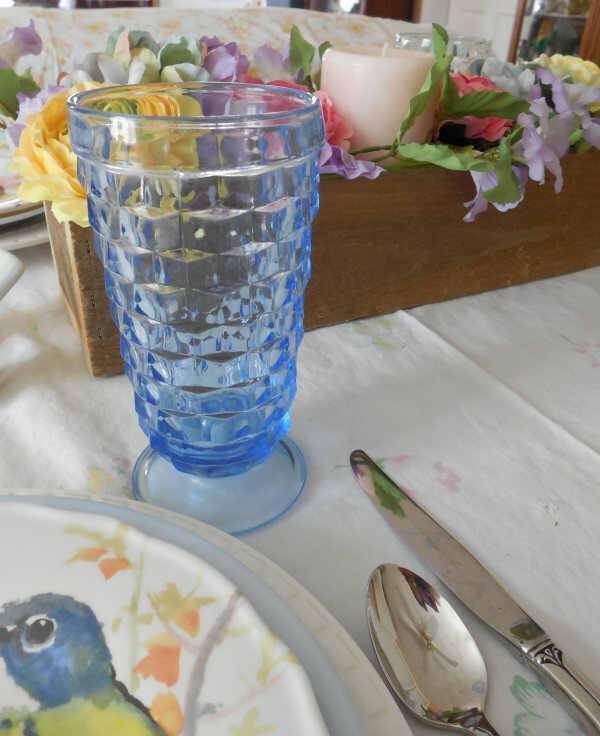 Blue and yellow napkins are also Pier 1 – always purchased on clearance! 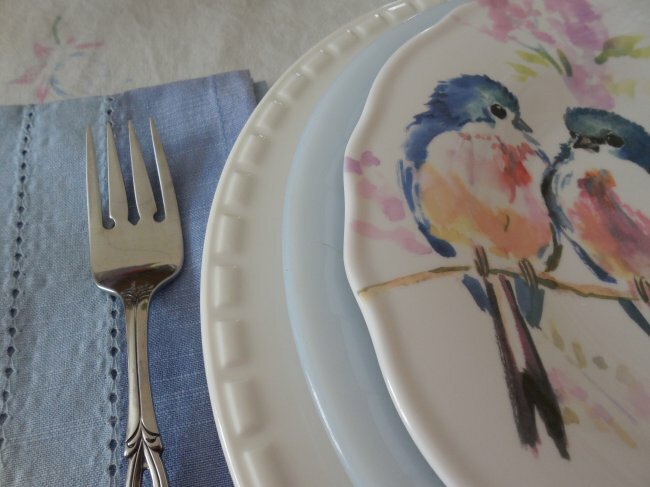 Our place setting starts with those sweet birds. 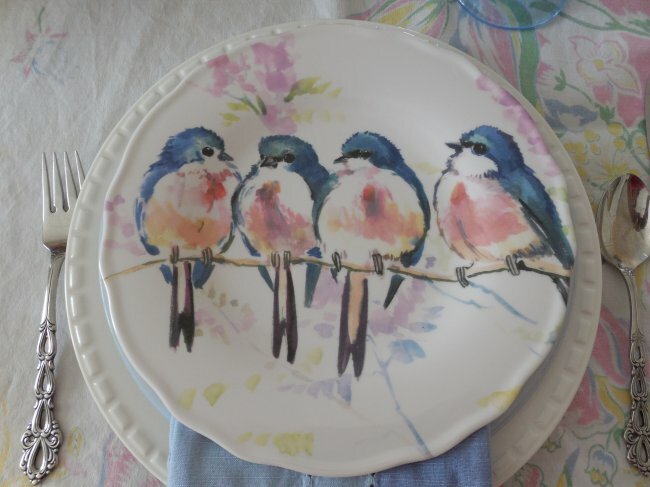 You can barely see the second layer because it’s so close in size to the bird plates. But these are Fireking in the faintest ice blue. 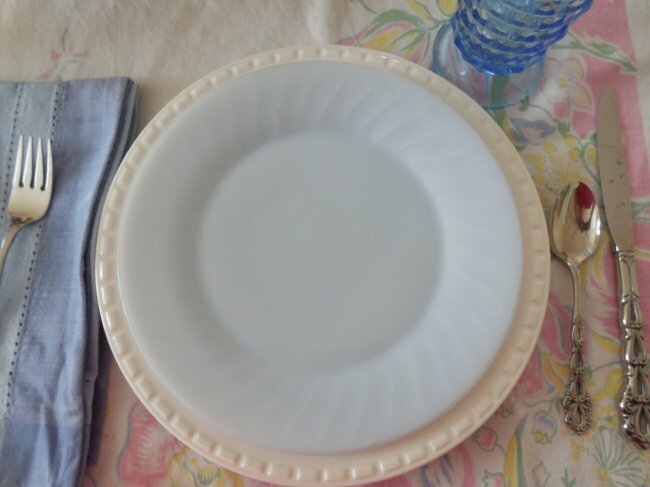 Next are some basic white dinner plates with just a touch of texture around the rim – it looks like stitching, doesn’t it? These are from Home Goods. 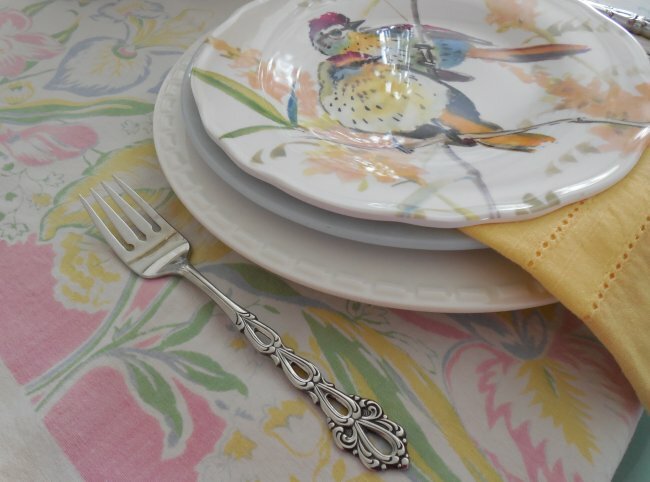 Our flatware is Chandelier by Oneida – my everyday set. The glassware is Whitehall by Indiana Glass. 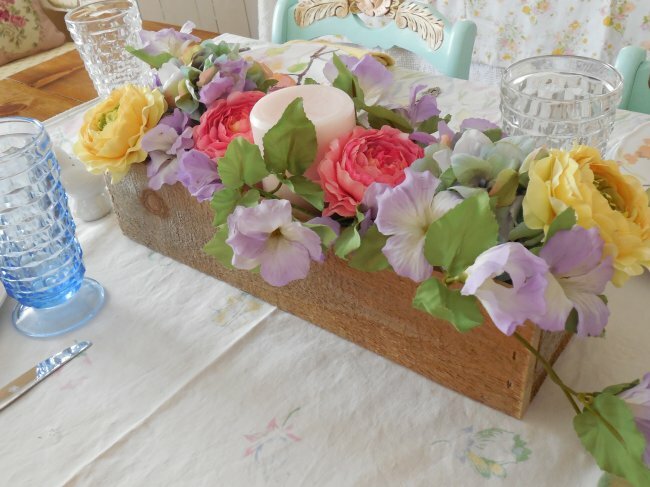 And, of course the centerpiece that inspired the table – pretty silk florals are mostly napkin rings, and the wooden trough is hand-made. Here, everything is gathered up and ready to go back into the cupboards. 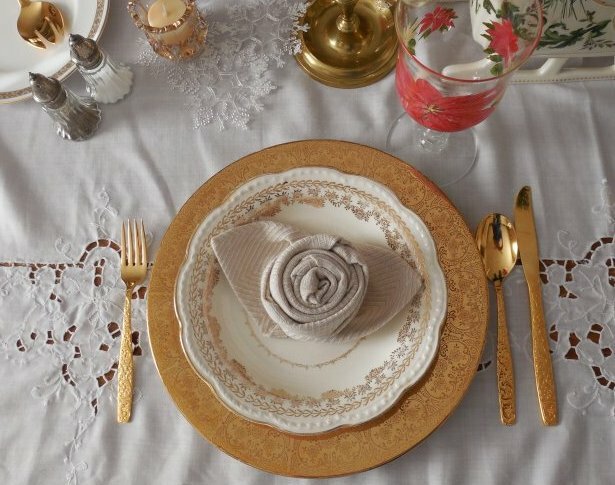 Here is an image suitable for Pinning if you have Pinterest boards devoted to tablescapes! 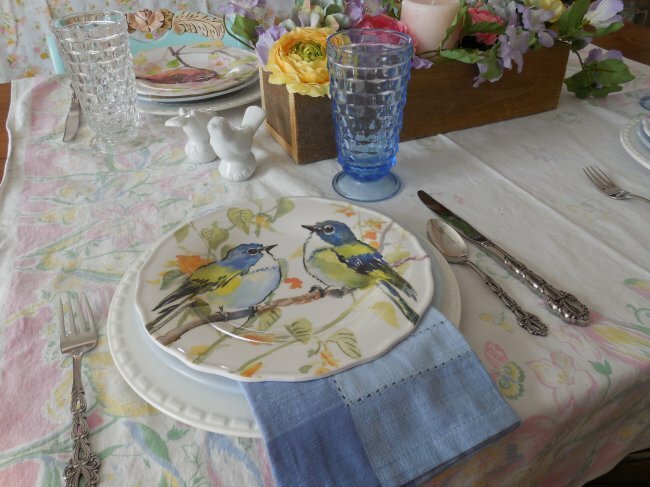 Such gorgeous table settings and those birds are wonderful!! Thank you, Ann! I’m sorry it took me so long to reply to your kind comment, but I do truly appreciate it – and you! I love those little birdies too! I’m slowly getting through all of the lovely posts on Susan’s celebration and what a treat I had reading your post! 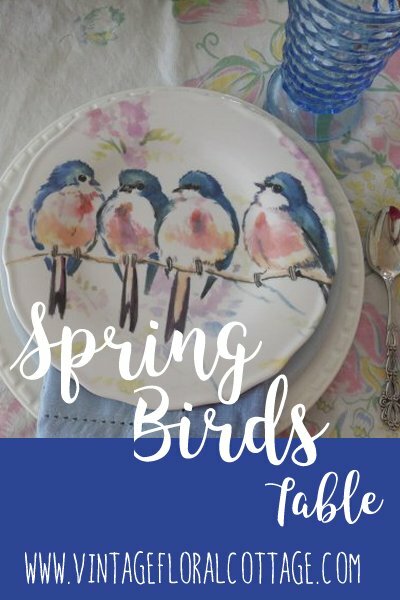 Your tables are absolutely stunning and your latest table with the songbirds is perfect for spring! 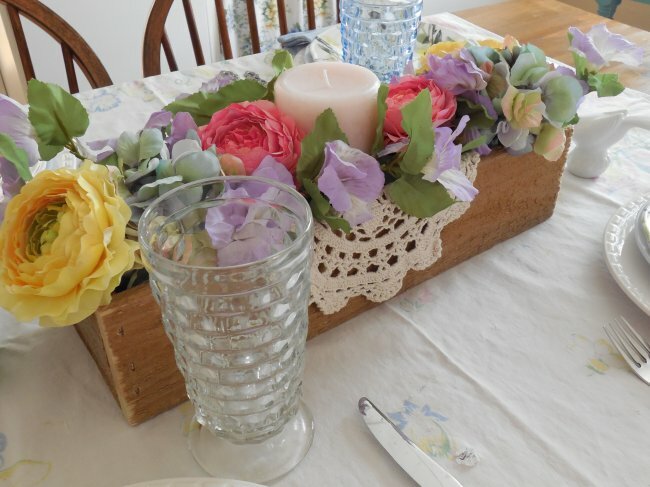 I hope you are out and about now and that you’re able to enjoy tablescaping again! Thank you so much! Susan’s 500th party was amazing (as they all are)! 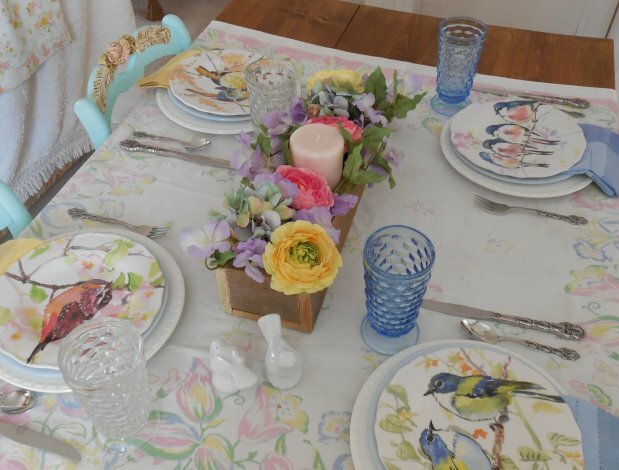 I’m so glad you enjoyed the tables I featured… I hope to do many more! Such pretty tables!! 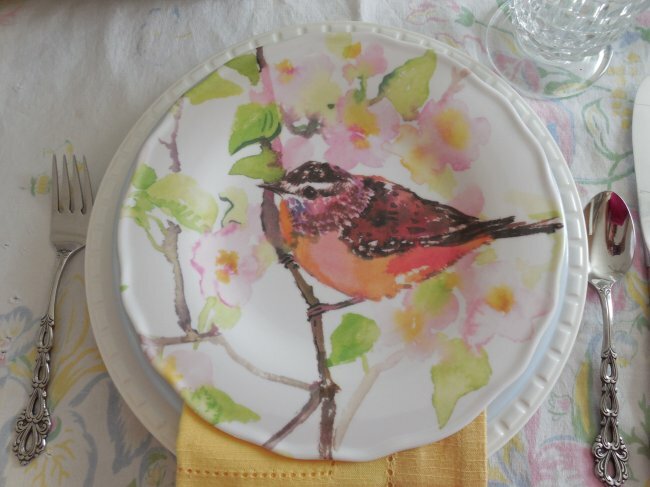 I love those sweet birdie plates too…beautiful! Thank you, Jordan! Glad you like them! 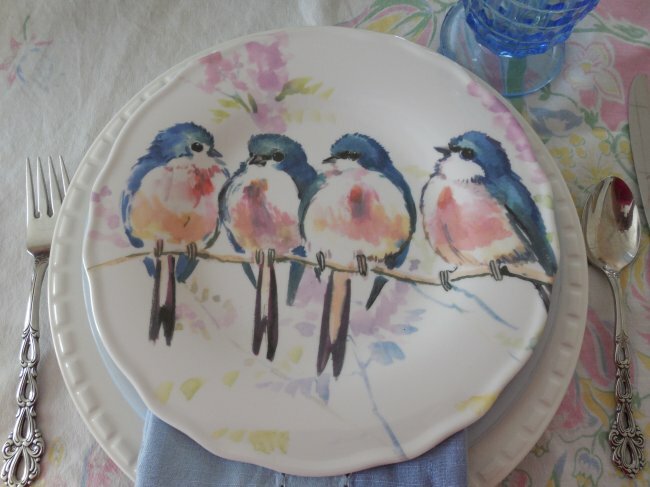 I just love those sweet little bird plates! !